The prestigious Financial Times officially announced the new international ranking of open and custom programmes in Executive Education. Eligible schools included those holding the EQUIS and/or AACSB accreditations. EADA’s Executive Masters appeared in the list of open programmes at number 61. This is especially impressive considering the more than 12,000 business schools around the world, 600 of those internationally accredited. EADA’s custom programmes for companies was once again ranked 66th in the world among the 70 schools that appeared in the exclusive ranking. “The Executive Education programmes on offer in Barcelona, and for that matter, in Spain, are extensive,” Mr Díaz points out. Just in Barcelona, there are more than 50 Masters in Marketing, each with their own schedule, price, participant profile and, above all, quality. “The combination of accreditations and rankings guarantees the quality and recognition of an institution in a mature market like that of Executive Education,” Mr Díaz explains. The Open Programmes ranking has been published annually since 1998, with EADA appearing since 2010. In the most recent ranking, EADA moved up 4 positions from last year to number 61 worldwide. The ranking took all of EADA’s Executive Masters into account, including those designed for local and international markets. Categories evaluated in the ranking included faculty, programme design and networking opportunities. The evaluation is distributed over three years, with 40% of information coming from the 2012 edition, 30% from 2011 and 30% from 2010. EADA stands out in the category of “international participants”, ranked 16th in the world. “This is a clear example of the internationalisation of our Executive Education portfolio, with 30% of participants coming from abroad,” says Mr Díaz. 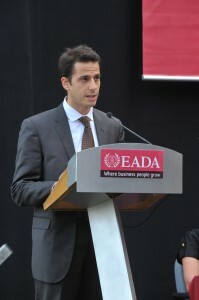 This international success is related to EADA’s strategic academic partnerships in Latin America and Europe.